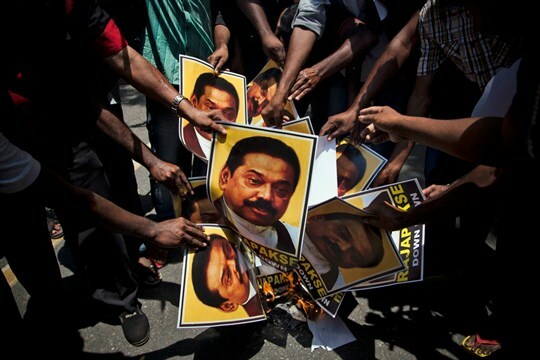 Supporters of Marumalarchi Dravida Munnetra Kazhagam, an Indian political party, burn portraits of Sri Lankan President Mahinda Rajapaksa during a protest, New Delhi, India, May 26, 2014 (AP photo by Tsering Topgyal). In this week’s Trend Lines podcast, WPR’s editor-in-chief, Judah Grunstein, and managing editor, Frederick Deknatel, discuss the sudden escalation of Venezuela’s political crisis and the U.S. response to it. For the Report, Jonathan Gorvett talks with WPR’s senior editor, Robbie Corey-Boulet, about the roots of Sri Lanka’s recent constitutional crisis and why its resolution is likely to remain fragile and tenuous for the foreseeable future.